Kids Reading to Succeed: What is Kids Reading for Success? What is Kids Reading for Success? 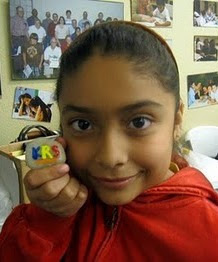 The KIDS READING FOR SUCCESS (KRS) literacy program got off the ground spectacularly in December 2008! KRS works with the kids of Students and Tutors Achieving Real Success (STARS), an afterschool program in Pasadena developed by the Lake Avenue Community Foundation. We read and work on art projects with their first to fourth graders on the first Saturdays of each month. *Volunteers show up for training at 9:00 a.m.
3. Donations! In addition to monetary donations, we would appreciate donations for books and art supplies. Monetary donations should be made to the Lake Avenue Foundation c/o STARS Literacy Program. Tax deductible receipt will be provided. We hope some of you will be interested in getting involved in KRS! Feel free to contact KRS for more information.